Credit: Copyright 2018, American Chemical Society. Scientists have identified a unique molecular binding mechanism that helps keep non-mammalian creatures in sub-zero temperatures from freezing. Antifreeze glycoproteins (AFGPs), produced by polar fishes, inhibit ice growth to prevent their bodies from freezing. This ice binding mechanism, which scientists knew was soft and flexible, remained a mystery until now. Using molecular simulations, scientists identified the details of this binding mechanism. Their results were published in early April in the Journal of the American Chemical Society as a cover article. "On the Earth, there are extremely severe environments, [including] the polar region," said Kenji Mochizuki, an assistant professor at the Institute for Fiber Engineering at Shinshu University in Japan and first author on the paper. "Most organisms cannot survive there, but some have adapted to these conditions by using the clever strategy of the inhibition of ice growth by antifreeze glycoproteins." Polar fish, for example, exist in water that is about two degrees below freezing. They produce AFGPs — with sugars attached–that stops the natural inclination of smaller ice crystals to bind into larger ice crystals. The problem with imaging these AFGPS and their attached sugars is that they do not have a specific three-dimensional shape, unlike other antifreeze proteins (AFPs). Without rigidity, it's difficult to image the protein to elucidate its structure and function. Prior to the study by Mochizuki and his team, scientists didn't understand how the antifreeze glycoprotein interacted with the ice or how it differed from regular antifreeze proteins. "Antifreeze proteins are rigid molecules and have well-defined three-dimensional structures," Mochizuki said. "On the other hand, antifreeze glycoproteins are soft and flexible molecules, so they cannot be crystallized." Flexible molecules tend not to bind well to ice, but scientists already knew antifreeze glycoproteins actually inhibited ice recrystallization better than typical antifreeze proteins, although they didn't know why, according to Mochizuki. In collaboration with the department of chemistry at the University of Utah, Mochizuki used molecular simulations to model antifreeze glycoproteins and examined how they interacted with the ice. "We thought that the flexible feature of antifreeze glycoproteins might yield a unique binding manner," Mochizuki said. "We found that antifreeze glycoproteins show various binding conformations… and walk on ice surfaces until they come across a step of ice." Mochizuki examined AFGP8, the shortest protein in the AFGP family. Mochizuki found that AFGP8 is segregated to hydrophilic and hydrophobic groups, the latter of which adsorbs to the ice surface–meaning it stays as thin film over the ice. The adsorption of AFGP8 to the flat surface of ice weak, though, so AFGP8 moves across the ice surface until it selectively binds to the growth points of ice. Mochizuki dubbed this movement "walking." 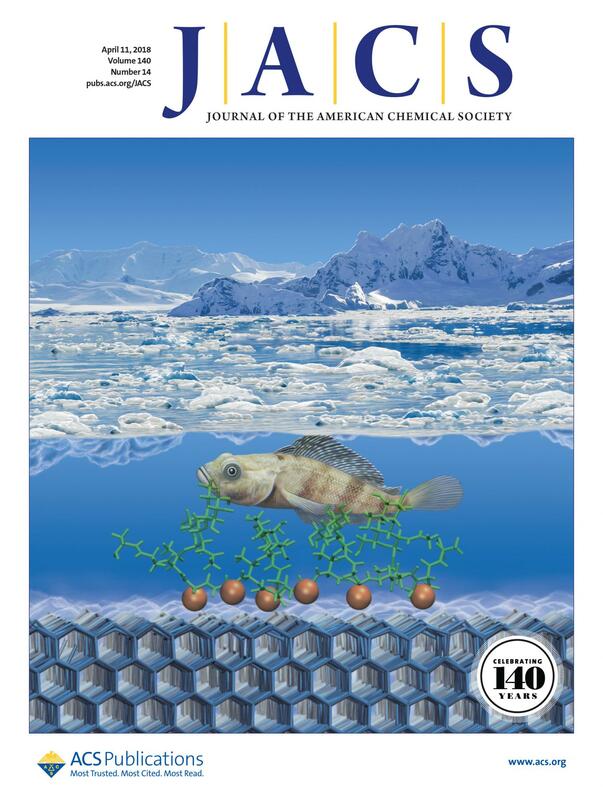 "Their motion of wandering on [the] ice surface and finding a step is significantly different from the binding behavior of antifreeze proteins," Mochizuki said. The finding has potential future applications for better preserving food and biological tissue under extreme temperatures. Mochizuki will continue to study AFPs and AFGPs to elucidate their mechanisms more precisely and hopefully design artificial proteins or polymers which exhibit stronger antifreeze activities.